Perspective on Pitti Today marks the start of another Pitti Uomo, the sprawling men’s clothing tradeshow held semi-annually in Florence. Pitti is technically a garment-trade insider’s event, as only clothing industry professionals and press are welcome. With the rise of informal media coverage on blogs and social media, Pitti is today a #menswear bacchanalia of commerce, trend spotting, and peacocking, relentlessly documented by a phalanx of street style photographers. It’s become something to make fun of, which makes sense, because the clothing industry, like the tech or gaming industries or any other, feeds on hype and attention, and people do silly things to get that attention. It’s also emblematic of a retail cycle of constant buying and selling that can seem crass. Especially to people who don’t make a living making or selling clothing, Pitti can seem decadent and ridiculous. But that doesn’t mean we should roll our eyes, shrug, and move on. It really is a menswear summit, where people from all over the world (ok; primarily the wealthy parts) and the clothing business mingle. Yes, people are trying to sell stuff, but in most cases they’re not just leaning on walls and exhaling coolly, they’re passionate about clothing, they have a vision, and they go in order to make it work. Pitti is where small manufacturers catch the eyes of retail buyers who can make or break their year. It’s where new brands take a gamble that buyers will pick up their lines, and they can survive to go home and start designing the next season. It’s where bloggers and start-up shops scour a fortezza-full of vendor booths for the next big thing. And it’s in spine-crushingly beautiful Florence, so those street style photos come out real nice. Styleforum sent David and Jasper to cover classic (i.e., tailored) clothing and men’s contemporary (i.e., edgier) stuff. They’re writing ongoing journals of the trip and will be posting about individual brands later. GQ sent photographer Tommy Ton to shoot photos of Pitti attendees. He’s been there before, and posts a good mix of the inspiring and exasperating. Simon Crompton of Permanent Style is in Florence and posting. Well-dressed retiree voxsartoria is live-tweeting Pitti even though he hasn’t been and won’t go. 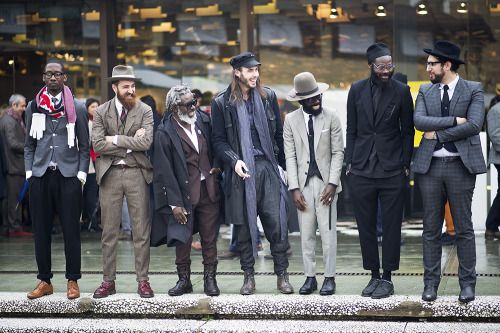 Pitti Uomo 85 shot by GWD.